I was about 10 years old, going to turn on a TV show I liked one night. I turned on the TV, and to my shock there was a transvestite alien running around in a green lab coat chasing a man in gold shorts! That was my very first exposure to the Rocky Horror Picture Show - the 1993 original Fox TV airing. It wasn't until a few years later when VH1 starting doing regular Halloween airings that I finally sat down and watched it and got into it. I bought the film on VHS in 1995 and watched it religiously every day after school. In 1998 I went to my first theater show, and after a year as "audience Eddie" I joined the cast. 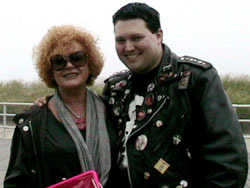 In 2001 I broke away and, with Las Vegas Frank-N-Furter legend KT Greene, co-created Frankie's Favorite Obsession. I am now the cast leader and primary Eddie for FFO, which has gone on to break attendance records in Las Vegas. I am best known for my portrayal of Eddie. I have been performing the part since 1999, guest performing at various shows (New York, Phoenix, etc) and have been cast in convention "all-star" performances all across the country (LA, New York, Vegas, Chicago, West Virginia). I am meticulous about my costume and character, right down to all of the little details (rings, jacket studs, Milbro slingshot, stitching on the boots, etc). I also occasionally alternate as Riff Raff and Dr. Scott. I have received several compliments on my costume from some of the original cast members from the movie including Stephen Calcutt (the tall Transylvanian), Yasmin Pettigrew (Sue Blane's costume assistant on both RHPS and Shock Treatment), Patricia Quinn and Little Nell. 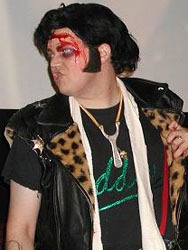 I have also won several costume contests as the character. Aside from RHPS, I love Shock Treatment. I have been performing since 2005, mainly as Farley Flavors (Faith Factory only). 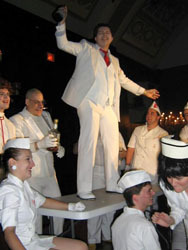 In 2008 at the Atlantic City convention I started doing Bert Schnick, which I must admit has been a very fun role. I went all-out with the little details, including the antenna cane. "Little" Nell Campbell congratulated me several times on my performance as Bert and even signed my German Laserdisc saying how great I did! Bill Brennan said that Barry Humphries must have possessed me - oy! Move over Ray Mitchell... I was honored to have my name mentioned by Mad Man Mike on the audio commentary for the Shocky DVD. What else can I say? "Get shocked or get out!" So let's see, some of my other RHPS adventures include: I've met Richard O'Brien, Perry Bedden, Lindsay Ingram, Kimi Wong, Sadie Corre, Sal Piro, Anthony Stewart Head (Frank, London Revival 1990 Cast), Ashton Kutcher (Criminologist Emcee at VH1's 25th Karaoke Show), Mick Rock (all the photos). I have a personal autograph from Meat Loaf. I also Co-created the now-defunct Eddie tribute site 'ex-deliveryboy.com' back in 2000 with Scott McDonald (Banned on Broadway, AZ - now Midnight Madness, Chicago). Own the original trailer on 35mm. Some general stuff: Graduated the University of Nevada, Las Vegas in 2005 with a major in advertising. My favorite foods are spanakopita, hummus and baba ganoush, Italian and Mexican. Drinks: flaming Dr. Peppers, water. Rocky Horror will always be a part of my life. It has seen me through good times and bad. It has opened my eyes to accept and understand other people, cultures, genders, sexual orientations, etc. It has allowed me to travel and see places I normally would never have had the chance to. It will always have a special meaning for me, and I highly doubt I will ever "outgrow it" as I've been urged many times to do. I will continue to support my cast and the entire Rocky Horror community. I'm very grateful for all of the friends I've made and experiences I've shared via Rocky. Thank you Richard O'Brien, wherever you are!